Early Morning we traveled on bus to Orvieto, Northern Italy on the Way to Assisi. This ancient territory and city was influential in the papacy in its own time and during the twelfth and thirteenth Centuries as a structured political power. The Duomo is a beautiful Basilica. The Duomo – “Located in Piazza del Duomo, the Duomo is an amazing masterpiece of Gothic and Romanesque architecture. A symbol of the city itself, The Duomo was commissioned by Pope Urban IV. Construction began in 1290, but took several hundred years to fully complete … Inside the cathedral are two important chapels. One houses the Corporal of Bolsena miracle (miracle of the consecrated host which flowed blood and stained the linen still preserved in the very precious tabernacle” (taken from Orvietoviva.com). So you need to look it up. It is a very important part of the Church’s history. After visiting this beautiful Church and celebrating the the Mass we had a tour through this small city, we moved on our way on bus, rainy as it was. We arrived early night just about for Supper (Cena Chay-nah). Monday morning we had Mass at the tomb of St. Francis of Assisi (main altar). With an inspiring homily from our Retreat Director, Father John Harris, OP, a Dominican Priest from Ireland. After Mass we had the tour of the Basilica. Beautiful church on the main floor recent completely repaired from the earthquake of 1997. The lower chapel is the one that contains the tomb of St. Francis. Our retreat was structured with presentations by Fr. Harris and Holy hour with the blessed Sacrament, Vespers in the House chapel in the evening before Cena. The theme was given to us about the beatitudes for the whole retreat. Tuesday we had Mass at the beautiful Basilica “Chiesa di Santa Chiara” (Church of St. Claire) where the Crucifix of St. Damiano is located hanging in one of the side altar chapels. This is the image from which the crucified Jesus spoke to St. Francis asking him to “rebuild my church” in the first part of the 13th Century (sometime in 1206, which was located at St. Damiano Convent located down the hill not far from St. Claire of Assisi Basilica). It is a beautiful Crucifix that of St. Damiano that made history in our church narrative of the times with the collaboration of the mendicant orders initiated by St. Francis of Assisi to serve as a model of the evangelical counsels so that the church leaders of the time would embrace humility and obedience, poverty and service to the poorest of the poor. Mass was very inspiring as we continued praying for all our parishioners and people who are part of our lives in the exercised ministry that we experience. Wednesday we celebrated mass at the Basilica of St. Ruffino up the hill. Another jewel in the city of Assisi. 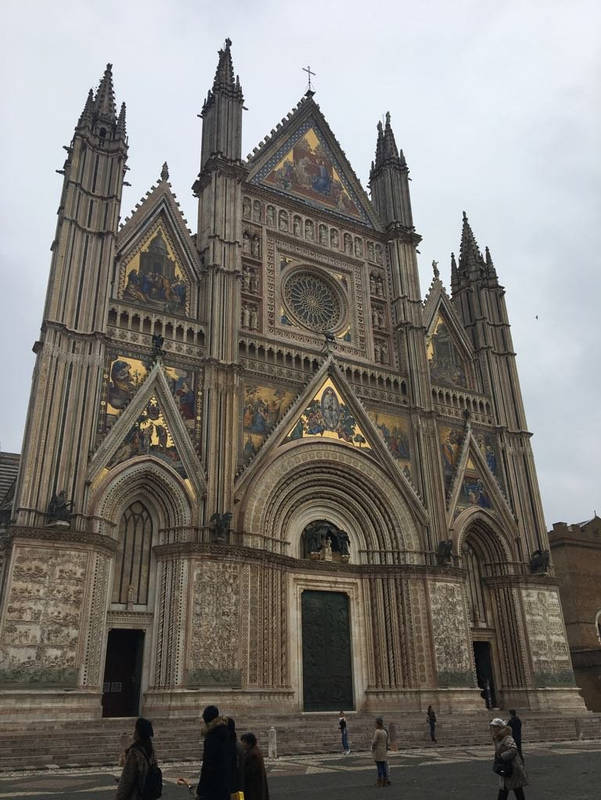 This is the Cathedral of the Assisi. A beautiful and unique church in the city. In this church St. Francis and St. Clair were baptized, also Friedrich II (1194-1250), is believed to be baptized there. He was the Roman Emperor and believed to stayed at the Rocca Maggiore during a troubled time of Umbrian territory. The Rocca Maggiore is the Fort-edified Castle-like structure at the top of the hill in Assisi. This Church is also part of the story of St. Claire’s calling to the vocation as a religious sister upon listening to St. Francis speak. This day in the afternoon I took some time to go to St. Damiano Convent down the hill. It is a beautiful old monastery that has its own simplicity surrounded by the natural environment of and songs of birds just like in the rest of the city of Assisi. This place of St. Damiano is where St. Francis body was visited and poor Clares paid respect to his body. St. Claire died on the 11 of August of 1253. Beautiful stories narrated if we could only be inspired by such holy lives given entirely to God. Spots are marked and other spaces as well where they spent their lives in prayer and works of mercy. Thursday we had the Mass at the Chiesa Nuova where St. Francis was born. At the mass I proclaimed reading from Exodus and did the psalm. It was an uplifting moment as we celebrated mass and admired the frescoes on the walls of the sanctuary, especially those of the Franciscan Martyrs who suffered so much as they were executed. That is what helps our spirits that any situation in life we go through may not seem as bad as it is, but we can always offer these instances into the hands of God. In this Chiesa Nuova is where the father of St. Francis locked him up because he thought he was insane and did not want him to live a life of poverty and simplicity. The very spot is marked as well. The rest of the day in the morning I took it for myself and traveled up the hill to the Rocca Maggiore. Then down to the Umbrian side of the hill road visiting other churches making my way to a Benedictine Monastery, into the Chiesa di San Pietro, that is under the Benedictines care. This is a very beautiful church at the bottom of the hill of Assisi. Eventually the following day (Friday, 16 of March) all of traveled in the bus to Perugia and visited Santa Maria degli Angeli where we had mass in the Chapel of St. Claire. This is a very beautiful Basilica filled with history. “The town started as a wooded tract of land where St. Benedict built a chapel in 576. It eventually fell into disuse and the land, known as Cerreto di Porziuncola, was ceded to Francis of Assisi in the 12th century. Francis and his followers rebuilt the ruins of the chapel by hand, along with rough stone lodgings and prayer rooms next to it. Their retreat became known simply as Il Porziuncola. It was here that St. Francis founded the order of the Friars Minor and where, in 1211, St. Clare embraced a monastic life and started her women's order with similar philosophy as the Franciscans. During prayer, St. Francis had a vision of Jesus saying that anyone who came here humbly and penitent would receive forgiveness. Not long after, pilgrims started arriving for this indulgence and to meet the gentle Francis and his friars. It was in a room here that St. Francis died” (cf. summerinitaly.com) on the night of the 3 of October, 1226. After Mass and our tour of Perugia, I separated from the group to travel to Padua and spend the night there. In Padua I got to visit the Scrovegni Chapel, which has a great collection of treasure Giotto Frescoes of the life of Jesus. This is like a mini-Sistine Chapel. The video sophisticated presentation was brief and there is so much to admire of the work of this great artist. The museum near the chapel has a great collection of Religious Paintings from the 16 through the 19 Centuries, both pagan and Religious. Artifacts of bronze and other mediums.